Most traditional religions in Africa have developed at the local level and are unique to a particular society. Common elements include a belief in a creator god, who is rarely if ever represented in art and directly approached by worshipers. Instead, the supreme deity is petitioned through intermediaries, or lesser spirits. These spirits may be related to the natural world and have control over powerful natural phenomena. For instance, Nwantantay masks used by the Bwa of Burkina Faso represent various flying spirits that inhabit the natural world and can offer protection. These flying spirits are believed to take physical form as insects or water fowl. In Guinea, Baga beliefs describe local water spirits, called Niniganné, associated with both wealth and danger that take symbolic form as snakes. Nature spirits, appealed to by Baule diviners in Côte d’Ivoire for spiritual insights, are conceived of as grotesque beings associated with untamed wilderness (example here). Other spirits represent founding ancestors, whose activities are described in stories about the creation of the world and the beginnings of human life and agriculture. The Dogon of Mali recount their genesis story with reference to Nommo, a primordial being who guided an ark with the eight original ancestors from heaven to populate the earth (top of page). Also in Mali, Bamana agricultural ceremonies invoke Ci Wara, the half man and half antelope credited with introducing agriculture to humanity (above). 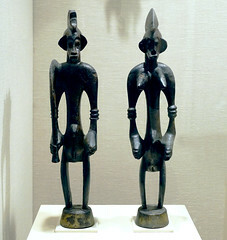 The original ancestors in Senufo (Côte d’Ivoire) belief are represented by a monumental pair of male and female figures exemplifying an ideal social unit (example left). The category of spirits believed to be most accessible to humans is that of recently deceased ancestors, who can intercede on behalf of the living community. Among the Akan in Ghana, ancestors are commemorated by terracotta sculptures that, when placed in a sacred grove near the cemetery, serve as a focal point for funeral rites and a point of contact with the deceased (example here). Fang societies preserved the bones of important deceased individuals in bark containers in the belief that their relics held great spiritual power (example here). In many large states, a living king and leader may be regarded as divine as well. In the kingdom of Benin, in today’s Nigeria, the Oba historically was considered semi-divine and therefore constituted the political and spiritual focus of the kingdom (example here). In addition to indigenous religions at a local level, other religions are also practiced throughout Africa. Christianity has existed in Egypt and northern Africa since the second century. The Ethiopian Orthodox Church was established in the fourth century by King Ezana, who adopted Christianity as the state religion (example here). In the late fifteenth century, Christianity was introduced into sub- Saharan Africa by Portuguese explorers and traders. Although most African cultures did not adopt the religion, the Kongo king Afonso Mvemba a Nzinga established Christianity as the state religion in the early sixteenth century (example here). During the colonial period, Christianity gained converts throughout the continent. Islam came to Egypt after 640, then spread below the Sahara in the eighth and ninth centuries through traders and scholars. On the east coast, Arab and Persian colonizers introduced Islam beginning in the eighth century. Although the acceptance of Islam or Christianity sometimes precluded the practice of traditional religions, in many cases they coexisted or were incorporated into preexisting beliefs. The adoption of Islam and Christianity also led to the abandonment of many earlier forms of artistic expression. Religious practice in Africa centers on a desire to engage the spiritual world in the interests of social stability and well-being. Annual rites of renewal among the Bwa, for example, are designed to seek the continued goodwill of nature spirits (example here). Political leaders also seek religious guidance to ensure the success of their reign. 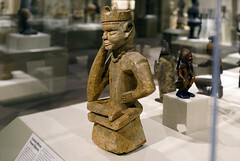 Fon kings, for example, referenced a divination process known as fa, which predicted the nature and character of their reign (example here). Personal misfortune, such as illness, death, or barrenness, or community crises, including war or drought, are also cause to petition the spirits for guidance and assistance. Art objects are employed as vehicles for spiritual communication in diverse ways. Some are created for use in an altar or shrine and may receive sacrificial offerings. The Dogon of Mali, for example, show gratitude to the ancestors by offering pieces of meat in a monumental container presented to the family altar (below). In the kingdom of Benin (Nigeria), cast brass heads commemorating deceased kings are placed on royal ancestral altars, where they serve as a point of contact with the king’s royal ancestors (above). Other objects are used by diviners to attract and tap into spiritual forces. 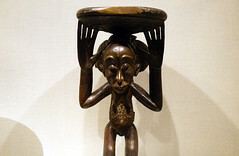 The dazzling beauty of an expertly carved Baule figure sculpture lures a nature spirit into inhabiting the sculpture, thereby aiding a diviner’s work (example here). Such objects themselves are often not inherently powerful but must be activated through ritual offerings or by a knowledgeable religious specialist. Fon diviners empower figurative sculptures called bocio with organic substances that ensure their client’s health and well-being (left). 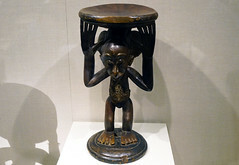 Similarly, Kongo ritual objects known as nkisi derive their potency from various substances, both organic and man-made, added to a carved figure by a ritual specialist (example here). The unseen forces of nature or the spiritual world are called upon to serve a variety of purposes, including communicating with the spirits, honoring ancestors, healing sickness, or reinforcing societal standards, through masked performances. Masquerades involve the active participation of dancers, musicians, and even the audience, in addition to the masked dancer, who serves as the vehicle through which these invisible powers become manifest. By donning a mask and its associated costume, the dancer transcends his own identity and is transformed into a powerful spiritual being. Among the Dogon, masks are worn at dama, a collective funerary rite for men whose goal is to ensure safe passage of the deceased’s spirit to the world of the ancestors (example here). Masked performances by members of the Bamana Komo association convey knowledge of their history, beliefs, and rituals to initiated members (example here). The massive sculpted headdress known as D’mba among the Baga is seen as a symbol of cultural reinvention and appears on various occasions marking personal and communal growth (example here). Among the Mende and their neighbors, masquerades of the Sande society encourage and celebrate young female initiates and offer a model of feminine beauty and spiritual power (example here). Cite this page as: Dr. Christa Clarke, "Religion and the Spiritual Realm," in Smarthistory, October 16, 2016, accessed April 19, 2019, https://smarthistory.org/religion-and-the-spiritual-realm/.